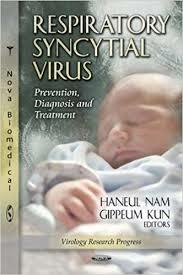 Respiratory Syncytial Virus Research Papers explain how the virus develops. Respiratory Syncytial Virus (RSV) a virus that causes upper and lower respiratory illness in infants and young children is the usual cause. The virus is transmitted from person to person by airborne droplets much as the common cold. Although this virus does appear as a mild viral infection in an adult, it can cause a severe illness in an infant . RSV is associated with outbreaks of acute respiratory illness each year in the winter and spring. In infants and young children, it can cause pneumonia, bronchiolitis (inflammation of the small airways of the lungs), and tracheobronchitis (croup). In healthy adults and older children, it is usually a mild respiratory illness. People with underlying pulmonary (lung) disease and the elderly are also susceptible to the infection. Although studies have shown that people produce antibody against the virus, infections continue to occur in people of all ages. Bronchiolitis is seasonal and appears more frequently in the fall and winter months. Bronchiolitis begins as a mild upper respiratory infection that over a period of 2-3 days develops into a condition of increasing respiratory distress with wheezing and a "tight" wheezy sounding cough .The child may have fever, cough, and trouble breathing. He or she may wheeze (a noise heard when breathing in and out) for 7 days and cough for 14 days. The child may seem more tired than usual with ear infections being quite common with bronchiolitis. Some of the telltale signs of an ear infection are ear tugging, ear pain, and fever. The infant's breathing rate may increase markedly (tachypnea) and the infant becomes irritable and anxious looking. If the distress is severe enough the infant may turn bluish (cyanotic). As the effort of breathing increase parents can notice the nostrils flaring with each breath and the muscles between the ribs retracting as the infant struggles to inhale air. This effort is exhausting and sometimes suggests imminent respiratory failure. Because bronchiolitis has the potential of being fatal it should be regarded seriously by the child’s parents. Paper Masters writes custom research papers on Respiratory Syncytial Virus and explain how the virus develops.